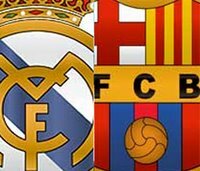 Tonight is the match I wait for every year since 1996 ,El clasico between Real Madrid and Barcelona , this is year is so much different from last year and I am so optimistic that wining is possible and yet may be with a good result . the only problem tonight I am gonna be watching the game with two of Real Madrid haters , they don't really hate Real Madrid but they just get so happy when they lose or play badly because then they can make fun of me all the night ,in return they made me get happy when AC Milan loses because it's their favorite team and this year AC Milan are so much worse than Real so this year might be the year where I laugh more . I can't talk much about the game but see this page for the best pre-match analysis you might ever see . for me this year is a reste my favor team plays in Serie B, I think you know what team I'm talking about. good luck for the two teams tonights, hope that they will play a good match so we can enjoy our time. happy Eid to you and all your family. I'm an FCB fan myself, but had no idea the game was on tonight!!! I'm a real madrid fan...and yeppeey, they made it!!! I was hoping I would post my review of the match but things got mixed up . Robinho was the man of the match and Raul did the best match for him in years .